College Football Playoffs - Who's Taking The Title? Last year was the first time the NCAA switched to the “playoffs” structure for college football. A select committee decides the best 4 college football teams are in the nation, which all play for the national title. This year, the four best teams are (1) Clemson (2) Alabama (3) Michigan State (4) Oklahoma. Therefore, (1) Clemson will play (4) Oklahoma, and (2) Alabama will play (3) Michigan State in the semi-final matchup. The winners of these two games will then play each other for the national title. For insight for our more avid college football fans, we turned to Five Thirty Eight’s FPI rating, used to calculate playoff game probabilities. 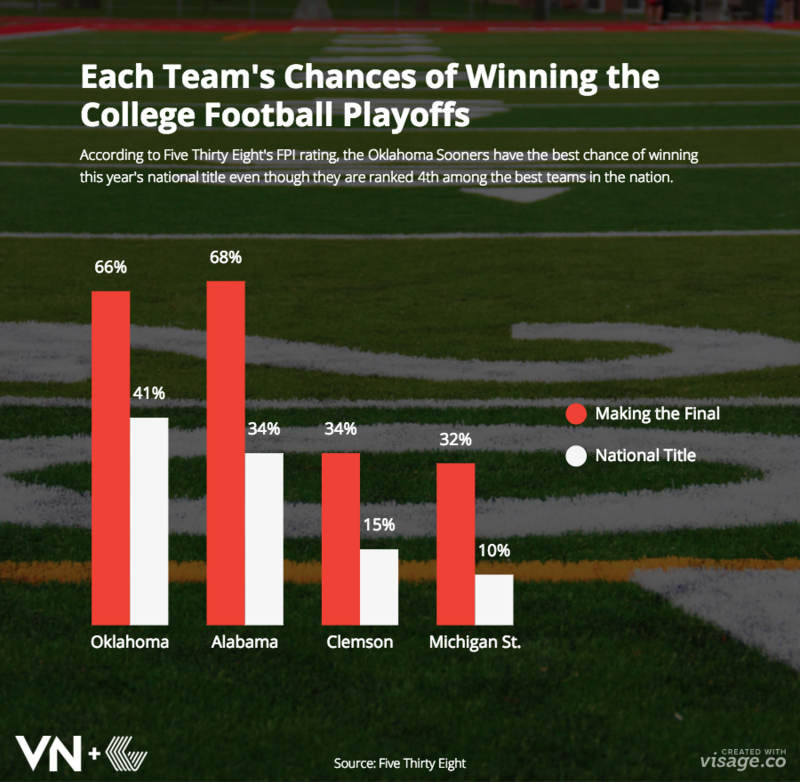 According to the metric, Oklahoma is the slight favorite to win a national title. More shocking than the 4-seed winning the national title is that they’ll have to go through undefeated Clemson to do so. Here’s a breakdown of each team’s chances of winning the college football playoff.